YouTube advertising can be an effective way of finding your target audience. With 1.58 billion active users worldwide, it’s safe to say that some of these users will fit into your target market. If you want to find out how to reach your target audience on YouTube then you’ve come to the right place! YouTube has a large variety of different audience options at your disposal to help achieve your objectives from sales and leads to website traffic and brand awareness. YouTube advertising has you covered. Let me take you through all your options and what goal it can help you reach. Affinity audiences are generated by Google where they segment users into audience pools who have specific interests and habits. When you select a related industry to your company, you can break it down further to see if there is something more relevant that matches your business offering. For example, Food and Dining is rather broad so you can break it down to targeting Coffee Shop Regulars, Cooking Enthusiasts, Fast Food Cravers and more! You would tend to use Affinity Audiences when you’re looking to drive product consideration and raise awareness of your brand by targeting your video ad with users who have already shown strong interest in your relevant industry. The Custom Affinity list I have created, shows that the sort of Google users I want to target on YouTube might have the Fitbit app download on their phone, that they regularly go to the gym, visit websites like Runnersworld.com and have shown search intent that they are avid marathon runners or a triathlon athlete. This is more specific than the broader standard affinity targeting. This audience targeting method will be good to use as users are actively interested and pro-active in your sector. However, it doesn’t necessarily mean they are looking to make a purchase decision right away. Though, with your video ads where you would have targeted this particular audience, the user may have become familiarised your brand and see’s your company as the perfect suitor for some new running shoes.This audience targeting method is higher up the Marketing funnel. In-Market audiences are very similar to the Customer Affinity audience on Google’s front-end but the key differential factor is that the user is strongly considering purchasing a product or service and are likely researching where they are going to take their custom. Google segments In-Market Audiences by product type where you can select and narrow further for segmented purchase intents. For example, you can select a broad product range like ‘Consumer Electronics’ and split it down to ‘Audio’ then go an extra step further with ‘Pro Musician and DJ Equipment’ if that is equipment that you sell. Google records their interest in these sectors through their own eco-system. 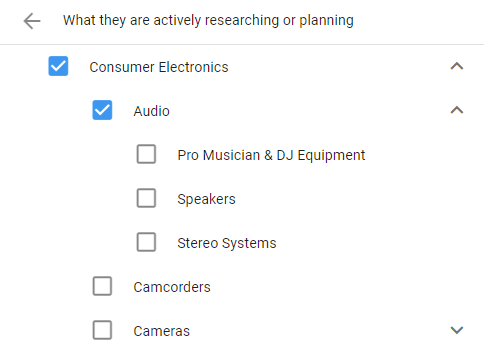 A user may be searching on Google for reviews on DJ Equipment, viewing the ‘Top 10 Must Have DJ Equipment’ videos on YouTube and has visited a music shop in their local area recently which is why Google would reside them within an In-Market Audience. In-Market audiences is perfect for companies who want to make a strong influence on the users decision making process and why they should choose your company over a competitor. Life events is still known as the baby in audiences on Google AdWords. It’s still a relatively new feature rolled out by Google and is still quite limited in what it can do. Currently, Life Events targeting only looks at milestones in a user’s life. For example, users who have recently or about to be graduated from college or university, recently or about to get married and users who are about to or who have just moved house. It seems ideal for the likes of Wedding Photographers and Moving companies! Remarketing is a very popular advertising method as the user is already familiarised with your brand and you target your advert at users who have interacted with your business before. This method is further down the marketing funnel and leads to higher conversion rates. Customer Lists – Utilise your own CRM data to re-target adverts to previous customers when they are browsing on YouTube. The only downside to Remarketing is the user may already be near the end of their purchasing journey and are looking to purchase or contact you for your products or services regardless of a Remarketing advert. The user may have visited your website in preparation and are planning to make a purchase on pay-day. In this situation, you would still be paying out for a user who may have still converted even without the Remarketing advert. That is a risk that you will have to take but I believe that rewards heavily outweigh risks. If your advert helps push them over that line to take action then I know I would be happy to pay for that lead or purchase. Similar audiences gives a degree of incrementality and allows a greater chance of reaching new customers. Similar audiences are automatically generated by Google when you upload your own customer lists or start growing and building out your own audience lists on Google AdWords. Google automatically generates a pool of users who Google deems a similar match to the audience list you are collating but aren’t currently in your own Remarketing lists. I’ve had my own personal success using Similar Audiences in the past and have found the audience match to be quite accurate and profitable. Big thumbs up to Google from me on this audience front! Deciding which YouTube audience route to explore all depends on what you are trying to achieve from your YouTube advertising. If you are looking for sales and leads from YouTube activity then using audience options which are further down the Marketing Funnel such as Remarketing and In-Market Audiences are more suitable to meet your objective. However, if you are looking to drive incremental sales and brand awareness then Affinity Audiences would help with this goal. A good ‘in-betweener’ will be using Similar Audiences. I hope you have found this helpful and good luck in your YouTube journey and hopefully you will find your target market on YouTube and grow a successful campaign!